Expo Veneto: In the year of EXPO 2015 the Venicemarathon celebrates its 30^ Anniversary!!! Event > In the year of EXPO 2015 the Venicemarathon celebrates its 30^ Anniversary!!! 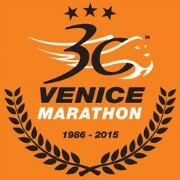 IN THE YEAR OF EXPO 2015 THE VENICEMARATHON CELEBRATES ITS 30^ ANNIVERSARY!!! On 25th October celebrate with us the 30th year anniversary of Venicemarathon! The most beautiful city in the world opens its doors to runners! the start takes place from Stra at the beginning of "Riviera del Brenta" the beautiful area close to the river where the rich and noble Venetians built their Vacation Mansions in the 19th century. the finish line is located in the historical center of venice in Riva Sette Martiri facing the lagoon. The first part of the course along the Riviera del Brenta develops in a landscape rich in history, art and culture. The marathon runs through the centrer of Marghera and Mestre . Then for two kilometers inside the "Parco San Giuliano" located in front of Venice reaching it runnig through a bridge almost 4 km long. You reach the historical center running through the renewed Port Area and here begins the most spectaculars part of the race . Canale della Giudecca reaching Punta della Dogana and Bacino San Marco ...you breath Venice and its atmosphere. Run accross the Grand Canal through the pontoon Bridge and then St. Mark's Square......unforgettable! And after all this emotions you reach the finish line in Riva Sette Martiri . • foreign athletes without membership but in possession of health certificat in accordance with health rules in force in their country. All athletes entered in the non competitive section will not have the right to access to the prize money, but only at the order of arrival. The VM10KM is a race on the last 10 km of the Venicemarathon race course. The start is from the Exposport – San Giuliano Park in Mestre, Porta Blu, and the finish line is in Venice in Riva Sette Martiri right where the Venicemarathon finishes. Venicemarathon is an international marathon globally recognized certified by the IAAF Silver Label, on the Olympic distance of 42.195 kilometers, is the most classic and fascinating discipline of athletics. Today Venice Marathon is a marathon of recognized quality, as evidenced by the IAAF Silver Label. A race that even after so many years, continues to exercise a fascination and appeal vivo and in athletes (with requests that continue to be more than 8,000 seats available) that the public is always ready to accept and participate in the marathon known as propose. For all Venicemarathon is something beyond the "Marathon of Venice": a container of events and initiatives participate with vivid interest not only by runners. San Giuliano Park is the centerpiece of the week pre-marathon on Friday with the unveiling of Exposport and Open Sport and Saturday with three Family Run involving children and young people across the province. Piazza San Marco, the Campanile in Venice, every step is an emotion!!! You run in on a unique course , where every kilometre is full of charm and suggestion; from the start, placed in front of Villa Pisani, the Brenta Riviera, with its villas, and Venice, run t through the pontoon bridge , St. Mark's Square, Campanile and Palazzo Ducale. Venice Marathon is a race that even after so many years, continues to fascinate and has an appeal both in athletes than in public, always ready to participate in the marathon proposes. The VM10KM, running about ten kilometers the most beautiful in the world, the last of the Venicemarathon. The race that allows everyone to run the fascination of Venice. The Family Run, non-competitive Family Run races organized in several locations of the province joining kids, families and all those who want to spend a day of health and fun, engaging participants in the marathon. Exposport, the fair of Sport and leisure, headquarters and the beating heart of Venicemarathon in the days leading up to the race, which takes place in the largest city park in Europe, the Park San Giuliano in Mestre.